We have an old standard apple tree that came with the house- don’t know the variety, but it is sour, a pie apple, rather than a sweet one. I have also planted a yellow delicious, which is my favorite. Most years, the big apple tree produces more than we could ever eat- we give away bags of them, and I made apple sauce last year, but many, many go on the ground, and in the compost pile. I don’t spray for worms, and because I don’t kill the worms, there are more worms every year. Most websites I found suggested sprays and traps and pheromones, which I don’t really want to mess with. Expensive and time consuming. Then I came across this guy (http://www.finegardening.com/pages/g00062.asp)at Fine Gardening magazine, and got a paradigm shift- instead of trying to kill all the bugs, why not just prevent the bugs from getting to the apples? 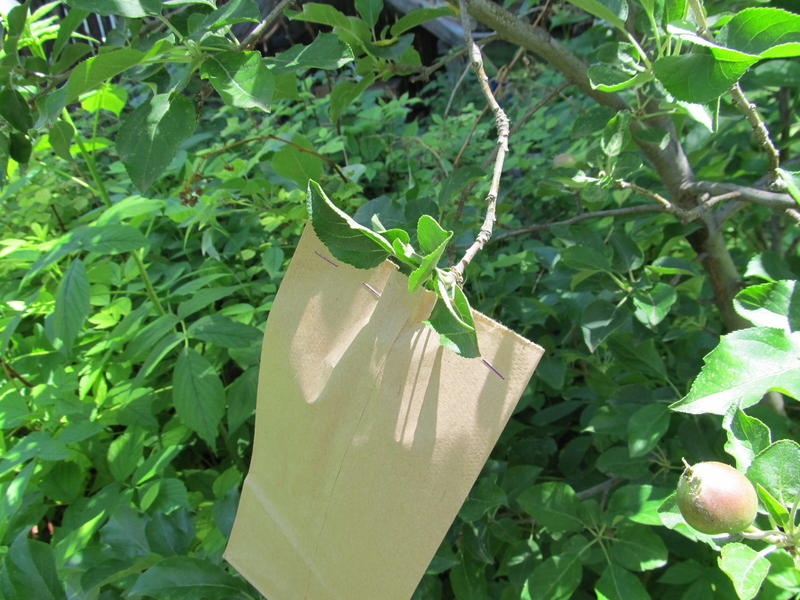 Put staples in the edges of the bags while sitting in the shade, then slip the bag on the apple and do the last staple. So, it’s late June, 4-5 weeks after my apples bloomed. I go through, select the biggest apple in each cluster that I can reach, and staple a paper lunch bag around it. The apple will grow inside the bag, moths won’t get to it to lay their eggs, and by picking off the smaller apples in the cluster, the chosen one will get bigger. The paper bags are kind of ugly, but I am hoping they will fade into the background- I’m not hosting a garden tour or anything. I will start with the golden delicious-(it’s my favorite, did I mention that?) and then put bags on the big tree for as long as my patience (and my stapler) holds out. I bought a package of 100 bags, but I don’t think I’ll get that far. This fall, I’ll update how it goes.